THIS IS ONE THE MOST POWERFUL STAND MIXER OUT THERE WHICH IS GREAT FOR PROFESSIONAL RESTAURANT OR HOME CHEFS. BEAUTIFUL COLOR WITH STAINLESS STEEL BOWL AS SEEN ON THE PICTURE. All-metal 10-speed stand mixer with powerful 575-watt motor. 6-quart stainless-steel mixing bowl; direct-drive transmission. Electronic speed sensor; auto shut-off; Soft Start minimizes splatter. Wire whip, burnished flat beater, spiral dough hook. Measurements H: 16.5, W:11.3, D:14.6. ATTENTION ALL CUSTOMERS: ALL ELECTRONIC ITEMS ARE 110V. 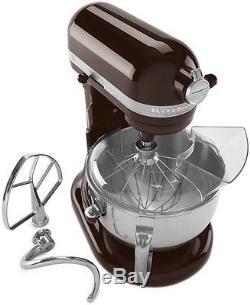 The item "KitchenAid RKP26M1Xes Pro 600 Stand Mixer 6 qt Espresso Big Large Capacity" is in sale since Monday, April 13, 2015. This item is in the category "Home & Garden\Kitchen, Dining & Bar\Small Kitchen Appliances\Countertop Mixers".